Single layer raft on UP! The UP! software doesn't allow for raft smaller than 2mm. But you can still disable it. Compared to other slicers I have used (Kisslicer, Skeinforge) the UP! raft is very thick ! I found this trick by accident... like very often. After I printed Hairygael's palm for the robot (see my previous post) I went for the thumb. As I am building the left hand I downloaded and printed the left thumb with the "no raft" option. It printed very well but I was surprised that regardless the "no raft" feature all my meshes had been printed above a one layer kind of raft ! As it was a nice thing, and because my print was a success, I didn't investigate that strange fact and went on for printing the smallest finger. I investigated the original stl file and it confirmed my thought : one mesh in the file was lower about 0.15 to 0.2mm than the others. Hey ! couldn't that be the trick for printing small rafts with the UP! ? The idea is to add a simple cube to your stl (I call it a "gizmo" and it can be seen on the left in the above photo) and place it's bottom 0.2mm below all the other meshes. My gizmo box is 15mm x 15mm x 2mm. That's what I did for the failed finger print (smallest finger) and the "magical single layer raft" trick worked just fine ! 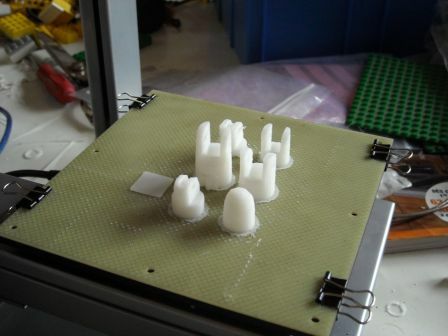 All the succesive fingers have been printed with this "gizmo raft method" at normal speed. Next experience should be to place the gizmo at 0.4mm below the print and see if the UP! will build a double layer raft. If that works it means we would be able to print a raft at exactly the size we want ! Now where does this magic raft come from ? I think the answer is that it's not a raft layer but an interface support layer instead. Anyway it does the trick. The layer is about 3mm larger than the part just like a raft layer so it can easily be taken off. I have printed all InMoov's fingers this way with great results. You should really try this "gizmo raft method", it works just fine !